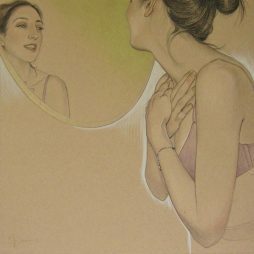 Virginia graduated from Glasgow School of Art in 1987, with a BA(Hons) in Fine Art with an outstanding achievement award in Historical and Critical Studies. Later in 1998-2000 she studied photography at Glasgow College of Building and Printing. Virginia has exhibited widely, from the Barbican Centre, London, to the Royal Scottish Academy in Edinburgh, and many galleries in Glasgow, including the Centre for Contemporary Arts. 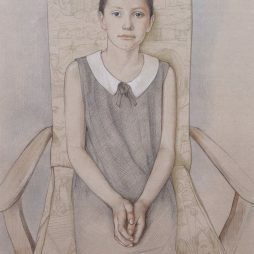 In 2017 in the Paisley Art Institute’s Annual Exhibition she won the Bessie Scott Award for her drawing ‘Lily was Bored’. Virginia spent the earlier part of her career working on several large historical mural installations for the People’s Palace, Glasgow, and Abbot House Heritage centre, Dunfermline. 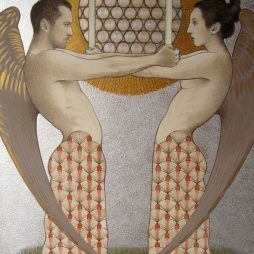 Her techniques are very traditional; she enjoys researching into the methods and materials of the old masters, and like them, has a high regard for the importance of drawing. 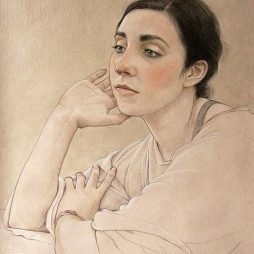 For the most part she works to commission, specialising in portraiture. Virginia lives and works in the beautiful village of Coulter in South Lanarkshire, Scotland.